House, 3 Bedrooms, 2 Baths, (Sleeps 6) private pool. Bikes included to explore. It’s an exciting time to come to the Big Island. The National Park is open again and we have new black sand beaches along the coast! Kaloli Point is along the East coast just south of Hilo in one of the many micro climates here. We are the “sunny “ area on the East Side. Blessed with ( cool trade winds and sunshine. What sets us apart from the rest? I am a local resident of the Big Island. I live just down the street. I will be here to take care of anything you need. Our home is the perfect spot to relax after a day of sightseeing. Our beautiful 3 bedroom 2 bath home has every thing you need in your home away from home. Granite counters and teak cabinets and an open layout make it a retreat to rest after a long day sightseeing. The backyard is surrounded by an Ohia forest, creating a place of serenity and privacy while cooling off in the in- ground pool. In the evening light up a fire in the outdoor fire pit and enjoy roasting marshmallows while gazing at the stars. The home is located just 2 blocks from the ocean, where you can walk along the cliffs and trails. In the winter whale watching on the cliffs is a popular local past time. The nearby historic towns of Kea`au and Pahoa both have restaurants, grocery stores and farmers markets.
. The master suite opens out in onto the lanai surrounding the pool. It has a private bathroom and shower. The Kingsize bed has a Vera Wang memory Foam Mattress. You''ll want to lounge in bed all day. The two additional bedrooms share a full bath, one bedroom has a queensize bed and the other a full size bed. Plenty of room to share with friends and family. This is a nonsmoking home. Just 15-20 minutes away from the Kalapana Lava Viewing area. The home is perfect for romantic getaways, family vacations. This home is NOT to be rented for parties, large gatherings, family reunions etc.. There is a maximum of 6 people including children allowed in the home unless otherwise arranged with me. Please note Hawaii is in the tropics. We have bugs, geckos, and the Big Island has coqui frogs whose mating call can be heard at night. Looking to split your vacation between the West side and East side? Check out our other VRBO 511024. Book both and get 5% off each booking. The privacy is important as well as being in the 'sun belt'. This lot was so unique as it backed up to a beautiful forest of Ohia. The natural wall prevents any neighbors from being behind us, so the privacy is amazing. Peace and tranquility. My favorite thing to do is to light a campfire and watch the stars. The area is mostly vacation homes and private homes so it's great to be able to walk or bike around without any traffic. blender, mixer, rice cooker, coffee maker The kitchen is set up to cook family meals with bowls, pans, baking pans etc. The open floor plan opens out onto the lanai from both the living room and the master bedroom. one floor, tile floors, doors wide enough to accommodate wheel chairs. Take a bike ride to the cliffs just a 1/2 mile down the road. 2 bikes are in the garage for guests use. This is a very nice home with all that we needed. Clean and tidy with nice bedding and towels. A couple of Bikes and of course, a great pool. Pool table? No, Pool Heaven! We continue to rebook because we love Maureen’s house and her friendly vibe. Convenient & comfortable. Best ever forever. I visit the Big Island an average of two times a year and I always check to see if there is availability here on Beach Road. The out doors here gives life a new meaning. It has a pool with all the trimmings. There is a shaded area with outdoor table and chairs, grill, very large backyard and a nice and quiet place to read your favorite book when you’re not enjoying the pool. It’s all about the outdoors for me and this home caters to all of the elements. The indoors is well appointed to say the least. I highly recommend this home to any one who is looking for a relaxing home to base their stay in a centralized spot in the South Hilo area. Mahalo again Maureen for a treasured place for to spend my quiet time. Thanks for the review! Glad you enjoy the Big island as much as we do. See you in October. This property is amazing! It has all the comforts of home, a breath taking pool, secluded, private property with easy access to all amenities. Maureen is a wonderful host who called to welcome us and to ensure we were comfortable and had everything we needed. Mahalo! 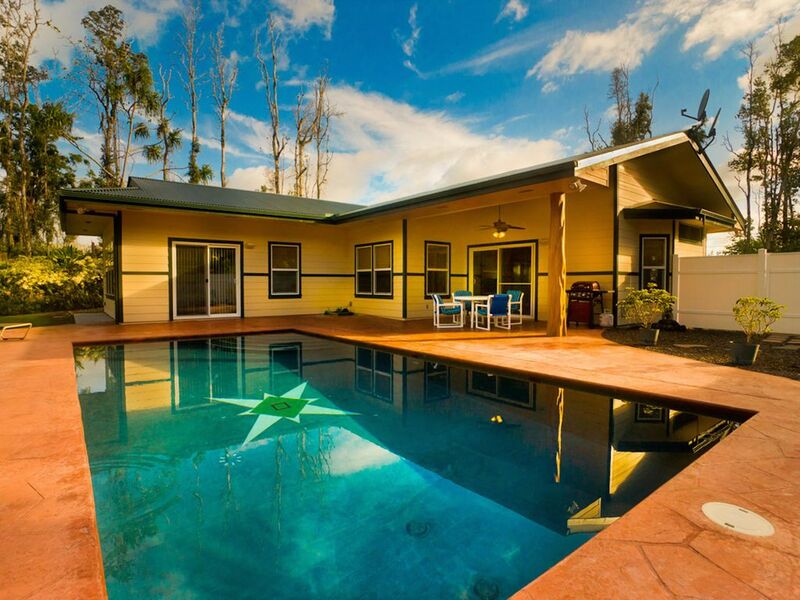 This house is an exceptional place to stay on the big island. The place is very spacious and has everything you would need. It is very secluded and private, no traffic or neighboring noise to speak of other than the soothing sound of the frogs and other jungle sounds that we found relaxing. The pool is perfect for the hot days we had with still plenty of shade to hide from the sun if needed. The stars at night are a sight to behold. Maureen made sure we had everything we needed just wished we could have visited over coffee, she laughed at the invite and said we must be Canadian lol. Thanks again for the wonderful holiday and making sure the weather was perfect. We love the place, it was like a spiritual treat for our whole family. The owner is very nice and helpful person. This part of the town is indeed spiritual vortex, the people of Hawaii are very friendly and spiritual, it was a visit to different world. Puna trail is next to home is must do, please wear long sleeves to cover legs and arms from mosquito love. There are so many things to experience the one week stay was too short for us. Thank you so much. Mahalo Hawaii. Shipman Beach is nearby and many of our guests have hiked out to explore the beach and see the turtles. There are shopping areas 7 miles from property Hot ponds, whale watching and more.